Yuzuru Maeda is born in Japan in 1978. She had received a Music BA from the LaSalle Collage of Arts, Singapore in 2009 and currently lives in Singapore. In her daily musical practice, she produces soundtracks, jingles and music compositions for independent films, commercials and her own video works. She performs mainly with the Sanshin (Japanese), Sarod (Indian) and Violin (Classical) with electronic sound compositions. Her musical lineage is La Monte Young and Ustad Ali Akbar Khan. She explores music and sound in cross cultural contexts and her musical works are described as ‘Beyond time and space’ which experess about divine energy and spirituality. Yuzuru has been making video-based music works with ‘Zentai Art Project’(yuzuru.weebly.com). These are visual explorations extended from her practice as a contemporary musician. In her art projects Yuzuru uses Zentai, the Japanese sub-culture to investigate the human conditions of identity, spiritual connections with cosmic energy in the universe and as a means to come to terms with one’s living environment. She currently organizes Zentai Art Festival (zentaiart.com) in Singapore and around Asia. Zentai is a short form for ‘Zenshin taitu’, which was developed in Japan. Zentai is a full body tights covering whole body with one-piece lycra fabric. I make over 100 zentai videos to explore different possibilities of art making using zentai. I make video based on the idea. I also improvise with the environment I am situated. I document all the process in the video because it is good to go back to the old process when I feel lost. By uploading the documentation on youtube, I also receive feedback from the audience. I am an organiser of zentai art festival. It oranges exhibitions, performance and zentai walk in Israel, Myanmar, Vietnam and Singapore. The world is getting more and more materialistic. People say the world will not last long if we continue to consume the way we do now. But I think we don’t need to look for a new invention that can save the world. I believe the key is to have fewer desires or identities. If we could live simply, and require less materially, the world could sustain its cycle.When I see a group of people wearing zentai, I can identify female or male but nothing more. And maybe this is enough. We could live just as male or female but now we are playing too many roles in society, like nationality, age, job, education, family and so on. I think zentai can remind us that it is good to be ourselves, the self that exists beyond identities. A group of zentai people look like they are merging into one another as if they are one whole energy. Zentai not only takes away the identity but also the individuality. It is no longer 20 people standing together but one big energy standing. And I think this is what we really are. We are not separate from each other. We are actually just one energy. What makes us think we are different from other person is the 'identity'. Identifying 'my' hair, 'my' skin, and 'my' thought, which makes everything complicated.So zentai reminds me to be a simple being. And this simplicity touches the heart and the core of Human beings. 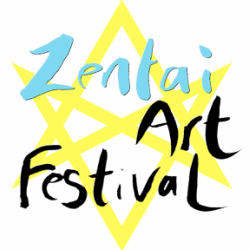 I am an organizer of the contemporary art festival “Zentai Art Festival” in the public art venues of Singapore from 2nd April 2015 to 10th May 2015. I wanted to see the different perspective on zentai art. So I organize the festival to share this art form with artists and audience in Singapore. I believe the festival reaches to the people who normally don’t attend art activities. I would like to engage more people like this and create a bigger sharing platform. Though this festival, I want to question ourselves “Who we are?”. Our framework for this festival will be an extension of creative projects by local and international artists presenting creative developments in the arts & cultural practices. These festival presentations are of established contemporary artists in various art exhibitions, performance art events; artists leaded workshops, film screenings as well as talks, cultural highlights and discussion that aim to engage the public audiences. We hope to share and promote “Zentai” culture with the Singapore public, as well as to the international contemporary art world. The objective of the festival is to be staged around various established art venues to focus and cast a wider audience on artistic productions that promote and enhance the experience of the cultural framework and social integration of Singapore. ‘Zentai Walk’ is a program that participants wear zentai suits and walk on the Orchard road. From the overwhelming positive responses of our previous zentai walk, we conducted a second zentai walk starting from the JCC (Japan Creative Center) going into the orchard road and return back to the gallery on the exhibition opening day with 48 people. The concept of the zentai walk is simply to have fun. It can be an escape from daily life for the participants and it can be a fun transformation with friends. When one wears zentai, it erases the identity of the face and creates new way of communication. The zentai walk can offer a very unique experience, which questions the identities that we are carrying in everyday life. It will also question what simplified life can offer as the experience erases distinctive differences from each other. The objective on this walk is to bring the art closer to the Singapore public. Anyone can join this zentai walk by just wearing the zentai suits and it presents full scale experience to both wearer and the public who witnesses the walk. This fun approach will bring art and art performance closer to Singapore audience. Zentai walk is going around Asian countries in 2015 and 2016. The objective is to have collaboration with local artists and learn about the country. And hopefully I can come to the conclusion that the asia is one. No matter the race, age or religion, we live in asia and the important thing is the purity of the soul. I believe curation is about building a connection between the people. I see no difference between the artist and the audiences. I curate and organize the performances based on the idea of communication. When people at the same frequency and mindset meet and work together as artists, audience or any other form, the collective energy enhances the individual creative energy and the inspirations. It can produce greater results compare to the creation that had been done alone, the experience of collectivism inspires me to organise and curate like minded artists, musicians and writers on a shared platform, as such to me, organising has become a part of my art making process. Within human society, there lays the communication. In language, art or in the silence there is form of communications too. The communication is about the energy between the people. With this understanding, I produce art as energy between people. It strengthen the artworks that the artist pursuit and it also strengthen the understanding of the world to rest of us.